"Being a vampire's familiar is like being a best friend who's also a slave." New Zealand filmmakers Jemaine Clement and Taika Waititi have successfully recreated the high comic charm of their 2014 vampire mockumentary film, What We Do in the Shadows, adapted for the new FX series of the same name. Acting as a spin-off or parallel follow-up, the show transplants the story to Staten Island from Wellington with new characters using the same acerbic wit and sophisticated deadpan humour to mock vampire life. Starring British comic actors Kayvan Novak, Matt Berry, and Natasia Demetriou as various hundreds-years-old, pansexual night stalkers from European history, it's impressive how quickly lived-in the high meets low concept premise is firmly established through physical comedy, visual joke telling, and the pure charm of the cast. Created and primarily adapted by Clement with some directorial help from Waititi and co-showrun by sitcom veteran Paul Simms—another collaborator from the Flight of the Conchords show—this new WWDITS shows just as much reverential promise as the much loved but oft seen cult indie comedy film it's based on. How they use the crushing mundanity of immortal supernatural life is so particularly amusing in its sharp foolishness. The introduction of comedian Mark Proksch's character as an American daywalker or "energy vampire" who is essentially an annoying office drone is another inventively fun addition to the antics and mythology of the universe. Also, the concept of "vampire familiars" (essentially slaves) is further expanded upon with actor Harvey Guillen's hapless Guillermo bringing such a weird but welcome specificity to his geeky subservient character. What We Do in the Shadows is such a delightful recreation of the original film's scrappy charms with a refreshing new setting and cast of undead characters. The show's effortless execution shows so much comic potential going forward. The adaptation is different but still familiar enough. 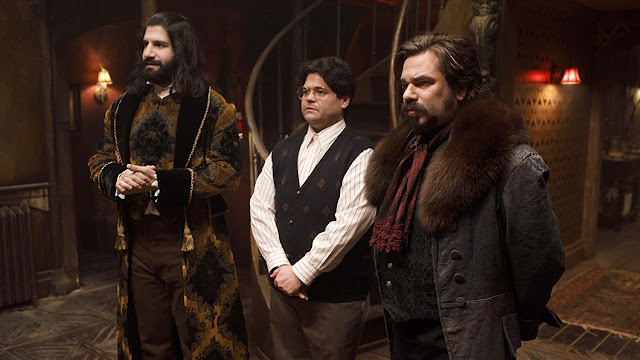 What We Do in the Shadows' first ten-episode season is currently airing Wednesday nights on FX.